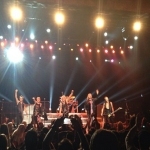 Def Leppard played their final show of 2014 last night in Temecula, CA with an unchanged 16 song set played. The band played a 90 minute set at the Pechanga Theater at Pechanga Theater at Pechanga Resort and Casino. Their first visit to this city and 48th full show of 2014. 'Promises' was played again with no other changes. There are no other Def Leppard live appearances planned until (at least) Spring/early Summer 2015 depending on the release plans of their new studio album. This was the fourth full show with guest Steve Brown on guitar who was standing in for Vivian Campbell while he undergoes Stem Cell treatment at a hospital in California.